The foundation is significant to the structural strength of house and the same applies to a walkway. A collapsing or falling walkway could be an ankle twister or a nimble risk. If the residential walkway is about to break or show warning signals of wear and tear, than it’s an intelligent step to go for repairs before it turns out to be a severe problem. There are several issues that can have an effect on your walkway including sunken slabs and pavers, cracks, weather damage and flaky pavers. To figure out repairing cost could be tough. Talk to a trustworthy contractor who can help out in deciding what the best you can do for your space. Setting up a walkway could be complex job and may appear like a nerve-racking project, especially when you don’t know what to do without knowing the cost estimates. You will not regret to choose Concrete for your walkway, as it is a reasonable and long-lasting option. Bonding and cleaning could repair small pitting and cracks whereas epoxy fillers would aid in large cracks. If your concrete walkway is slightly cracked than you can also install interlock tiles on top to have a fresh walkway with no devastation. 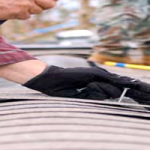 AP roofing contractor offers excellent apartment walkway repair in Los Angeles.